This is Cedarwoods Steamboat Linus, the dog to whom all other Poplin dogs will forever be compared. February 27, 2001 – June 25, 2013. He was a great dog with a hilarious personality. He was named Linus because of his affinity for blankets, even as a small puppy. Fitting name (and habit) for the dog of a quilter, no? The above photo was taken in our back yard in the summer of 2005. Soon after, I took it to Allied Photocopy, my favorite local printer, and asked them to blow it up for me in black and white on their large-format printer. It didn’t matter to me if the resolution was good, since I was planning to use the big photo just to trace the outline. A whole lot. Apparently. But I digress. 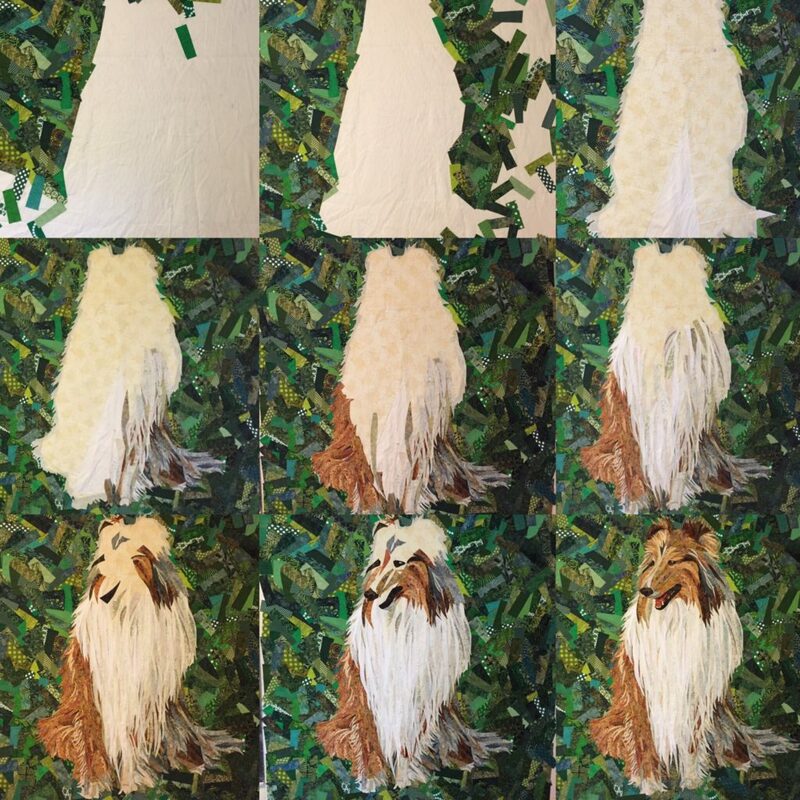 So I came home with this gigantic picture, and used the dining room windows to trace out the image into sections of similar colors, numbering every…. single…. one…. of them. 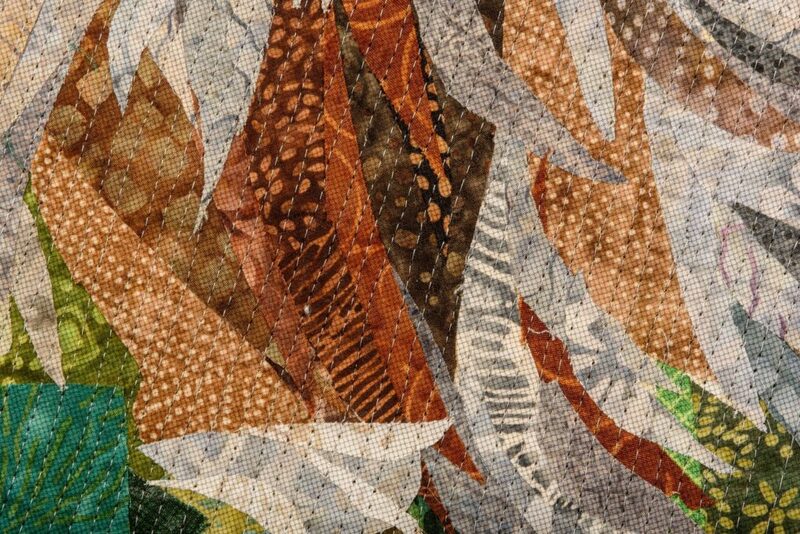 I think there are over 400 sections of fabric carefully numbered in this. 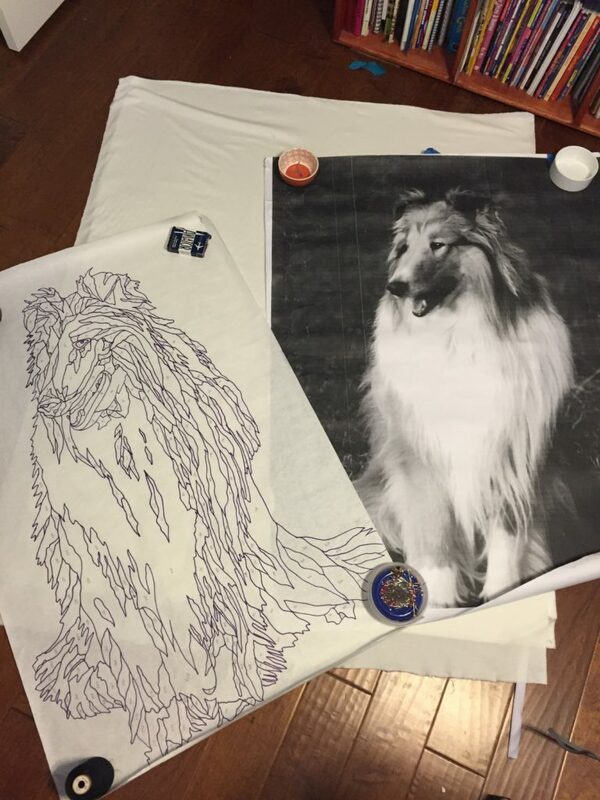 I have two copies of this tracing — one with sharpie, shown above, and one done on freezer paper with a Micron pen with registration marks so that I could cut out the pieces of fabric and attach them perfectly to their neighbors. 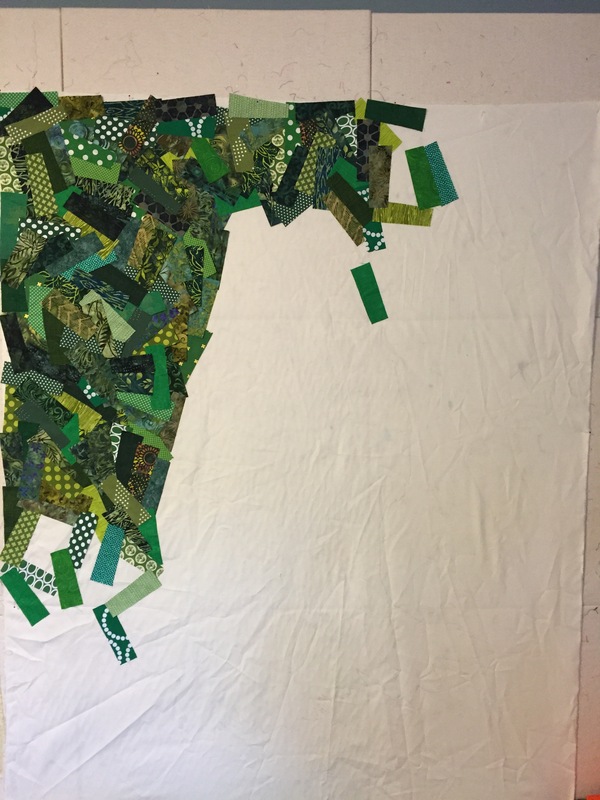 My plan was to cut individual pieces of fabric in a gazillion colors and needle-turn applique them to a background piece of fabric. The problem with this idea? I don’t applique. It’s not my thing. At the time, I didn’t even really know how. I started on the project in 2006, and quickly stopped when I realized I’d be 400 years old before I finished. Not planning to live until I’m 400, I tossed out that effort. Take Two, in late 2006: I thought, I KNOW! 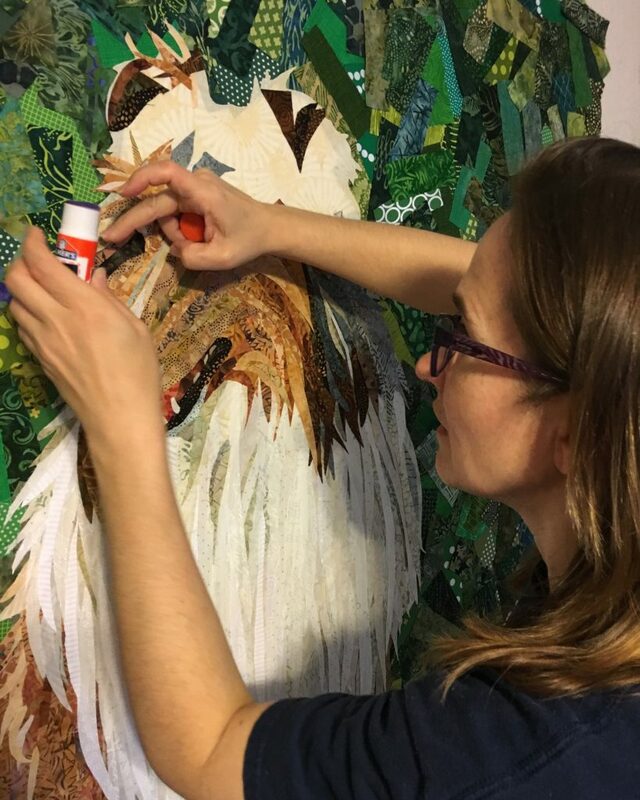 Fusible applique! So I started again, tracing a section onto fusible web backing paper and trying a few sections of fabric that way. Again, when I realized just how much fusible web that would take, how rigid and difficult to quilt the finished piece would be because of the adding and subtracting of layers and layers and layers… and acknowledging that I don’t have a table-sized lightbox for placing all of those little parts, I gave up again. I tossed that effort too. In 2011, I tried again. I went to a retreat weekend and chose an out-of-the-way spot in the corner and spread Linus out on the floor. I traced him again–now the fourth time–onto plain white Kona cotton (I have a roll of PFD white that I originally bought for dye work). 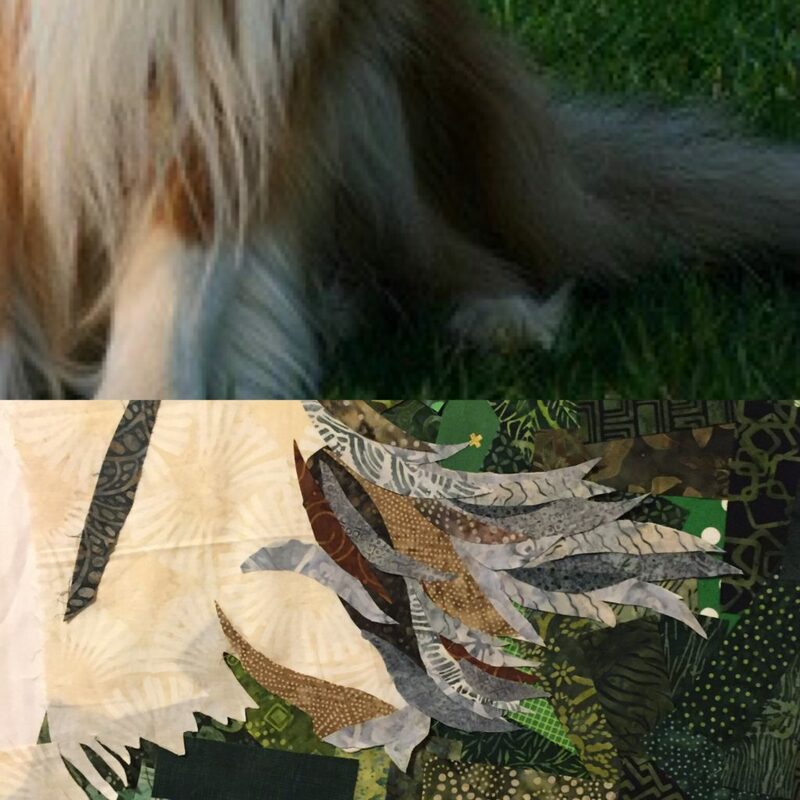 With the photo nearby, I selected fabrics from my stash of batik charms and started trying to put him together. I crawled around on that floor all weekend. By the end of the weekend, I knew this wasn’t going to end up the way I wanted. What I could see in my head very definitely wasn’t coming through in fabric, so once again I abandoned ship. I kept this attempt until after the fire, when it was returned to me in a tangled mess after cleaning and restoration. So I threw it away, too. By this point, Linus was 10 years old and really slowing down (which is saying something, since speed was never his gift anyway). I was worried that the quilt would become a memorial instead of a celebration, so I just let it backburner. 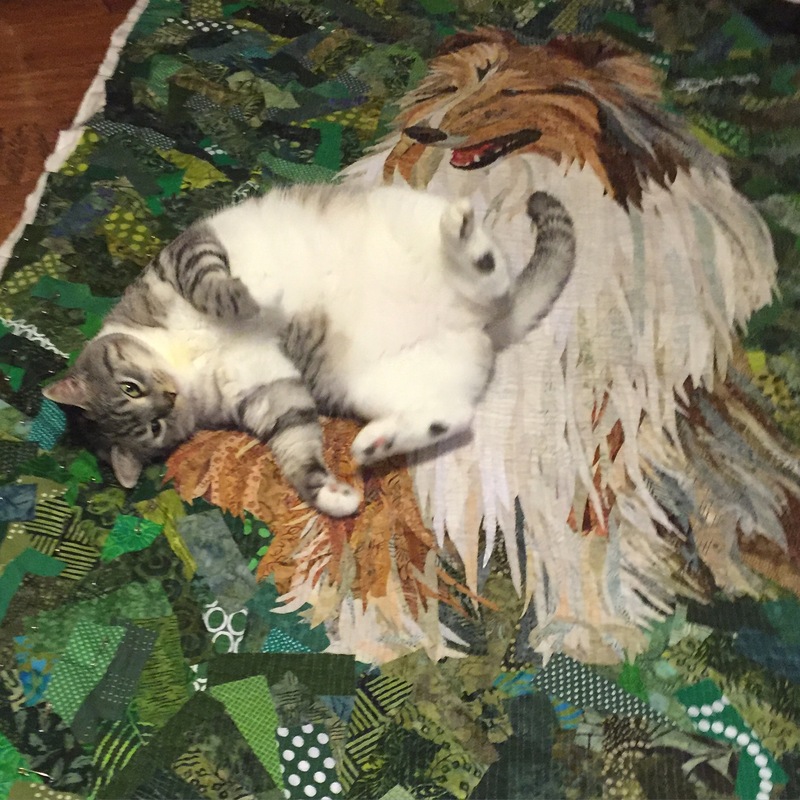 Linus died after a stroke in 2013, and I didn’t want to work on the quilt for a while. 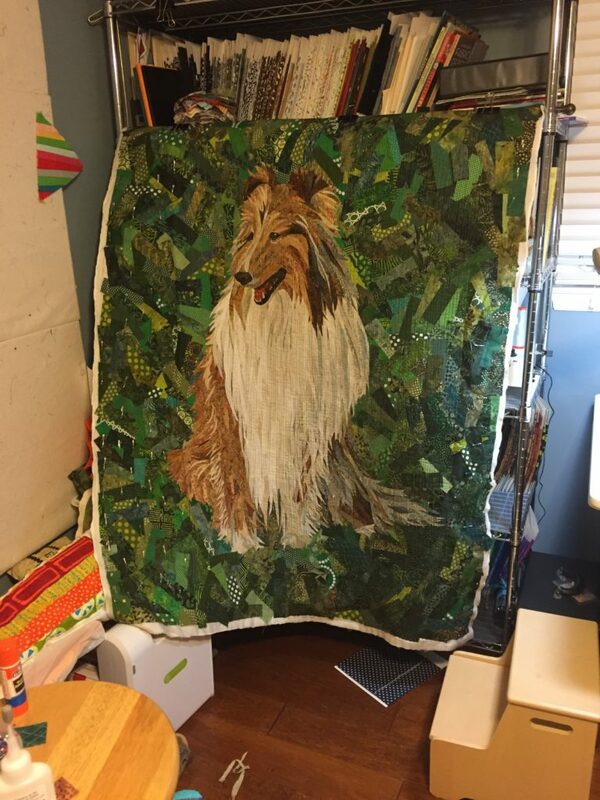 It was always on my list of quilts I wanted to do, but just seemed unreachable: the proper tribute wasn’t in my skillset yet. And then… AND THEN! I took the Making Faces with Melissa [Averinos] class in April of this year that I wrote about recently. 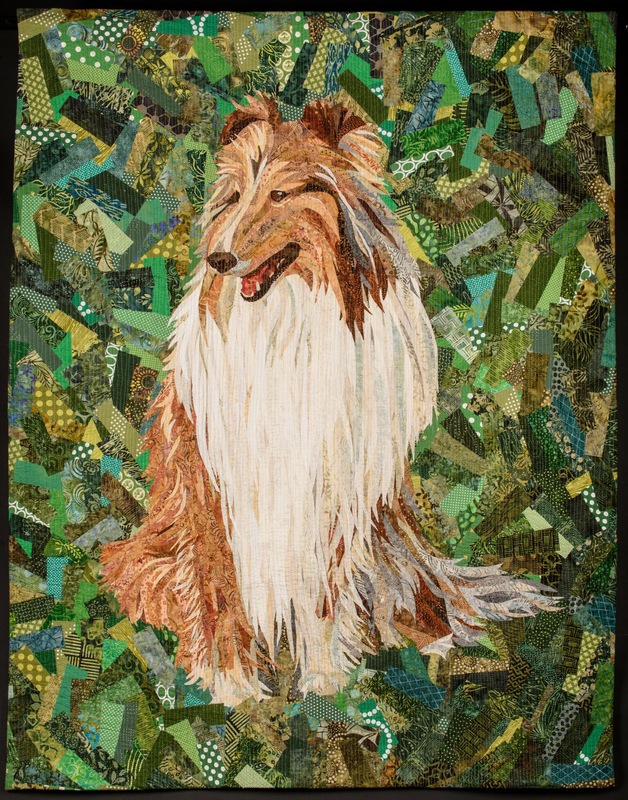 And suddenly I knew how to make the tribute quilt for Linus. I abandoned the Technicolor Linus idea, deciding instead that I’d go for a more literal representation. 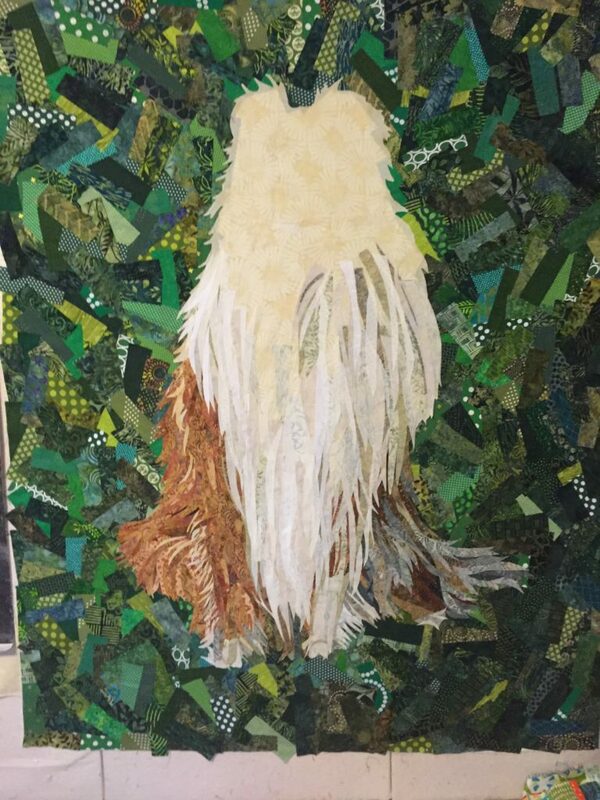 And because of what I’d learned while doing the face quilts, I’d do the background first. 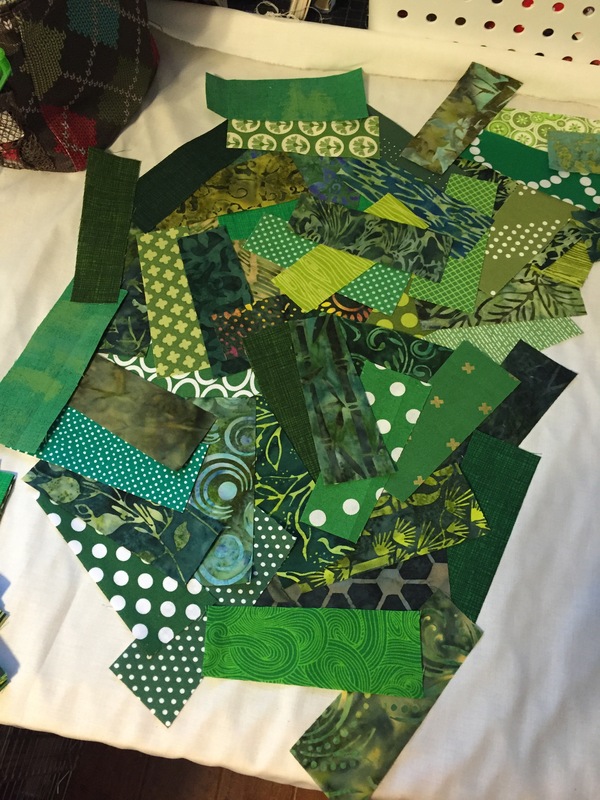 I pulled hundreds of green batik charm squares and added some modern and traditional greens to the mix. Because I knew that the whitest part of Linus’s collar had to be REALLY white, I knew that batik fabrics weren’t going to be quite right for that. But I needed the batiks for the shading of everything else. 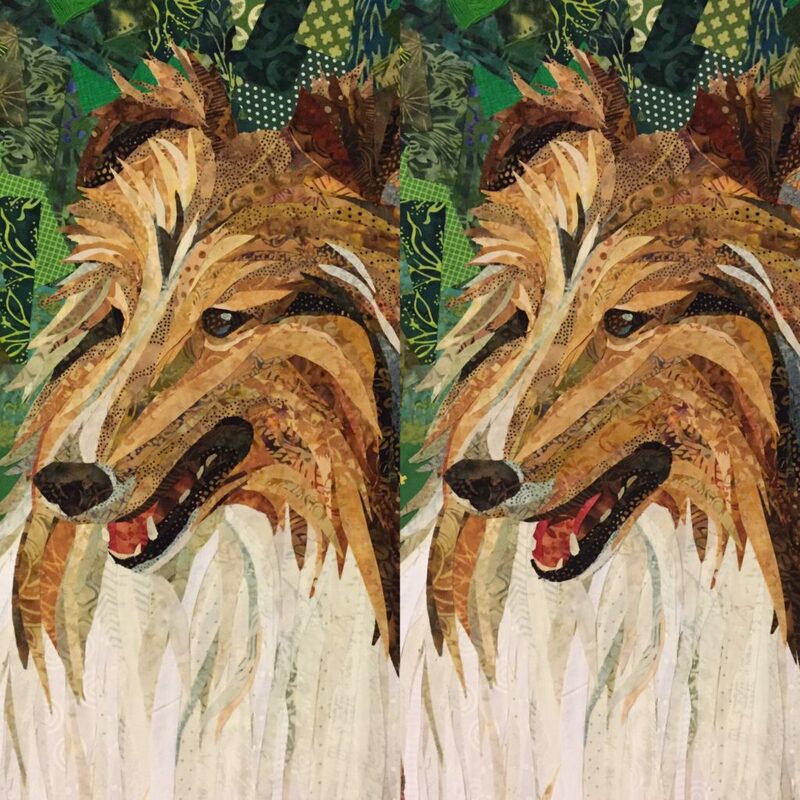 So having a variety of fabrics in the background meant that I could have a variety of fabrics in the dog as well, and it wouldn’t look weird. Alone, I’ll admit that the background looked kind of weird with the mixture of fabric types. 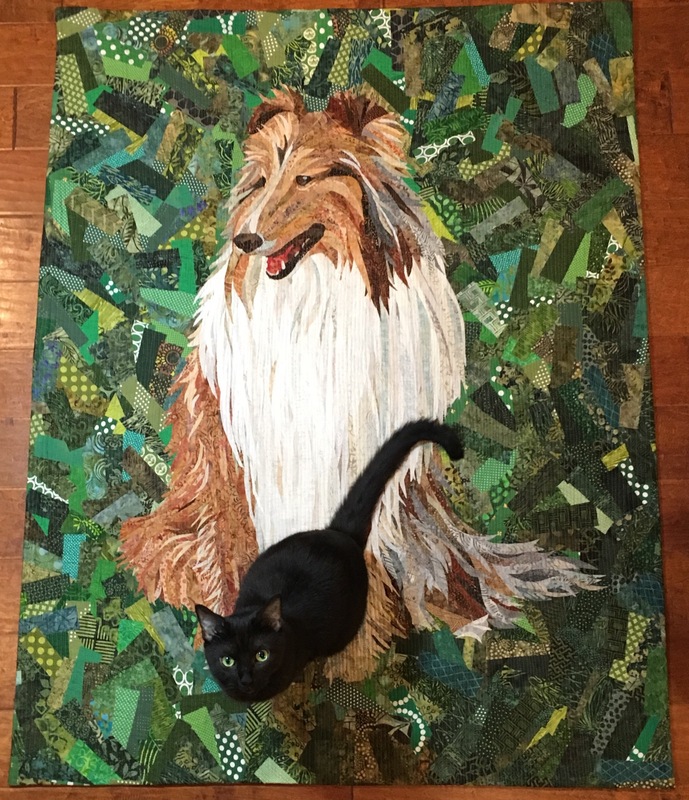 But because I wanted the focus to be absolutely on Linus, I didn’t want the background to add too much texture or dimension. 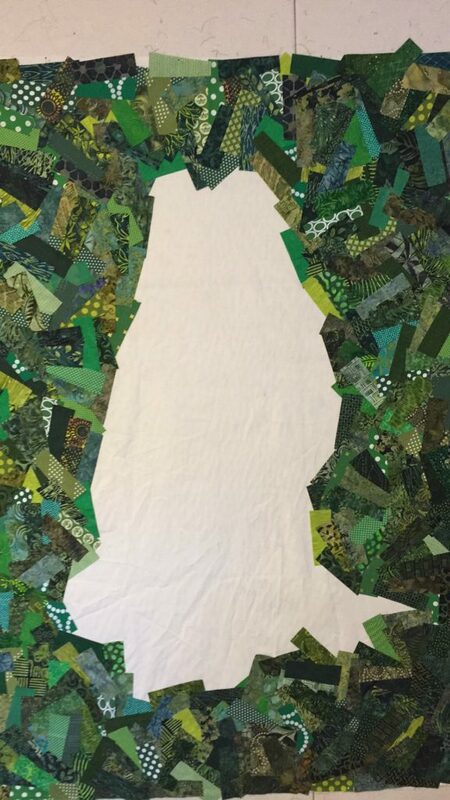 After roughly tracing Linus (tracing number five now… ::sigh::) onto another big piece of white Kona cotton, I layered the trapezoidal green fabrics on the white to surround him. I just used a dab of Elmer’s Glue Stick — the kind you buy in the school supplies section at the grocery store — to secure the center of each piece of green up there. That way they could be pulled off and repositioned easily if I didn’t like a placement. This took a while. 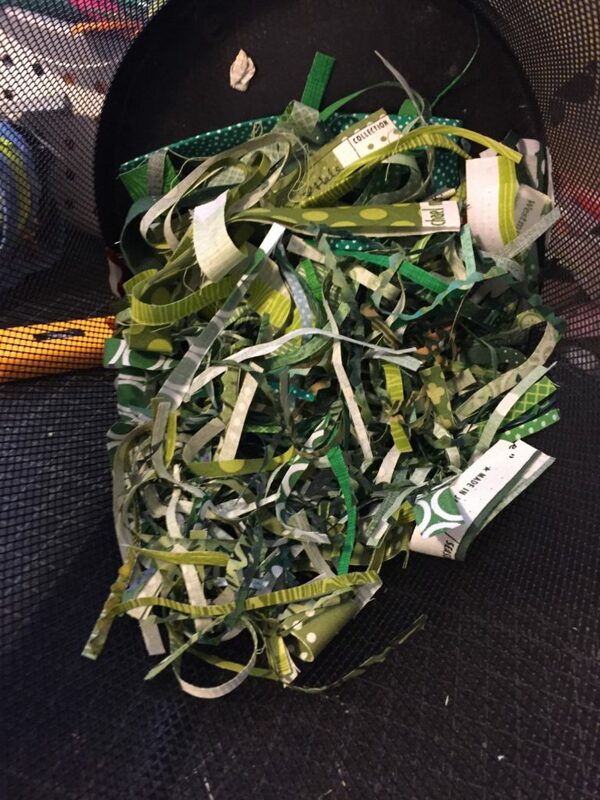 And I kept having to cut up more green. I started with a small amount because I wasn’t stupid — after failing three previous times I wasn’t going to commit to cutting up all of my fabric this time either. I wanted to see if it was going to go well before I made that much of a sacrifice. At this point, I was getting obsessed because I could see that the idea was definitely going to work. So I cut up ALL of my green batiks and a 4.5″ strip of all of my modern greens. 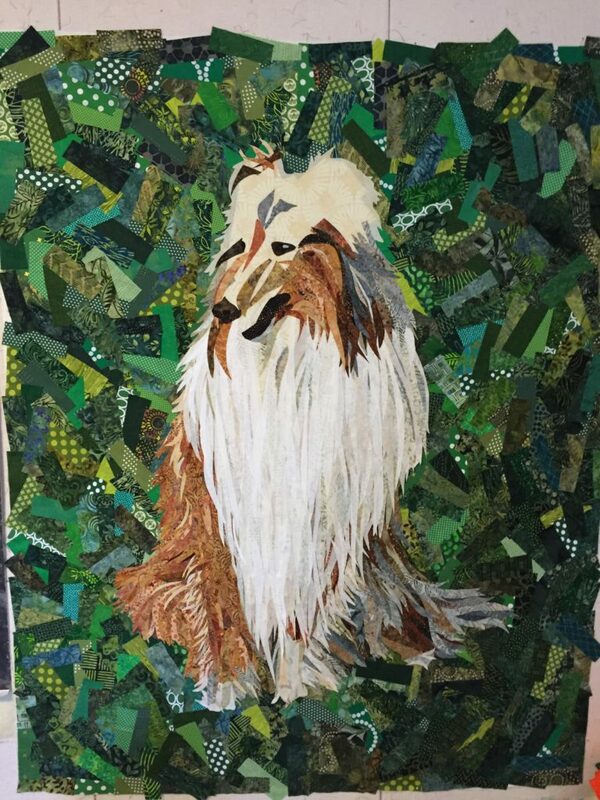 As I neared the end of covering the background I had to break into the blue-greens to have enough, but I managed to avoid shopping for more greens. 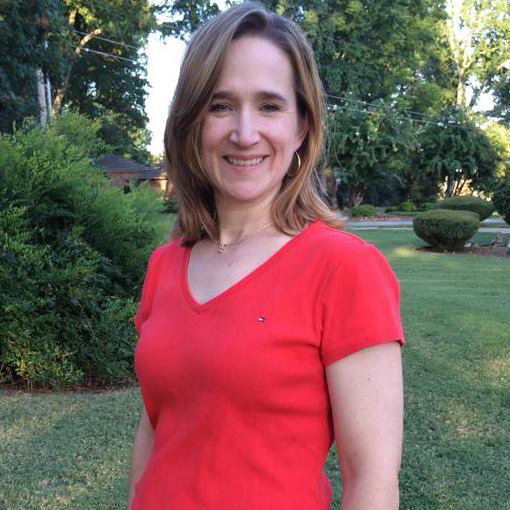 There’s probably about 5-6 yards of green fabric up there for the background. At this point I was procrastinating, because it was Go Time. I needed to start working on building Linus himself, but after 10 years and 3 previous failures, I’ll admit to being intimidated. 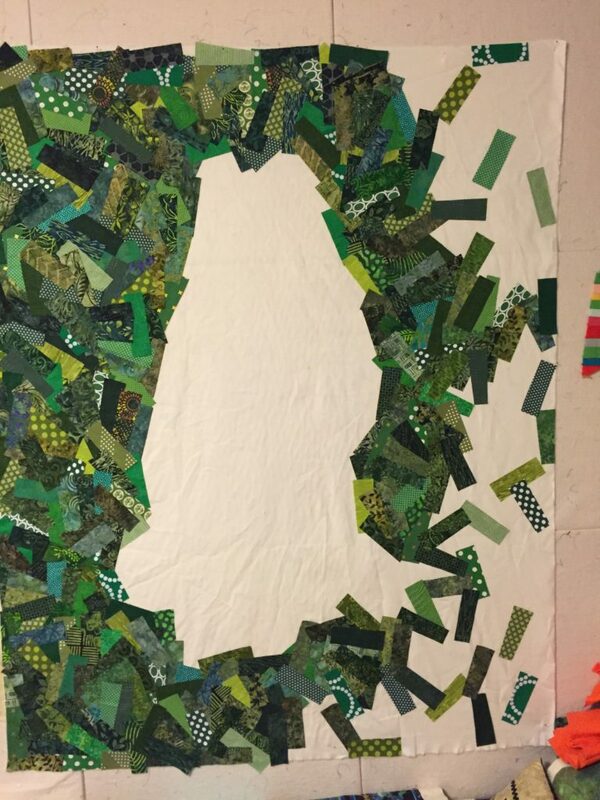 So I grabbed some odd scraps of light fabric on my cutting table and traced parts of Linus AGAIN (yeesh) so that the distinct outline of him would again be visible on the background. Using my pencil tracing underneath the green as a guide, I glued up this sixth (!!!) tracing to give Linus fuzzy edges for me to follow as I layered his hair. I put the big photo on the wall next to the fabric piece so that I could constantly compare the two, and make sure I was being true to the photo. I also made the color photo the lock-screen on my phone so that I could see the color version as well. 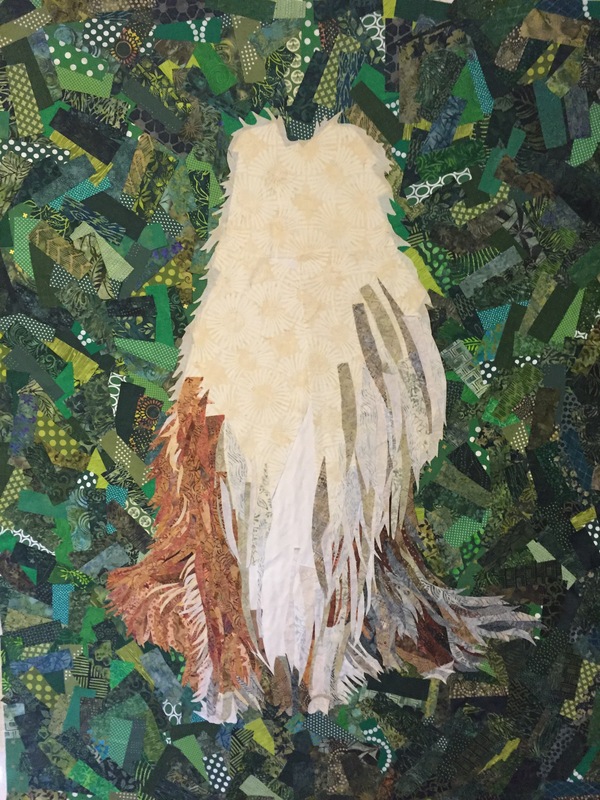 Then I chopped up more batik scraps into slivers and chunks and started building. I decided to start as his feet and build up, for two reasons: first, because the layering of the hair would make more sense that way. Second, my theory was that I’d have more confidence as I neared his face. Theoretically. So I started with his tail. The dark gray section was to help me keep track of where that leg would end up being, though that dark gray wasn’t necessarily going to stay there. Jerry came in: “The tip of his tail wasn’t gray, it was white.” Yes, dear, I know that. But it was in the picture. Here, look at the picture. See? Gray. I’m being true to the picture. It’ll look right in the end. Trust me. 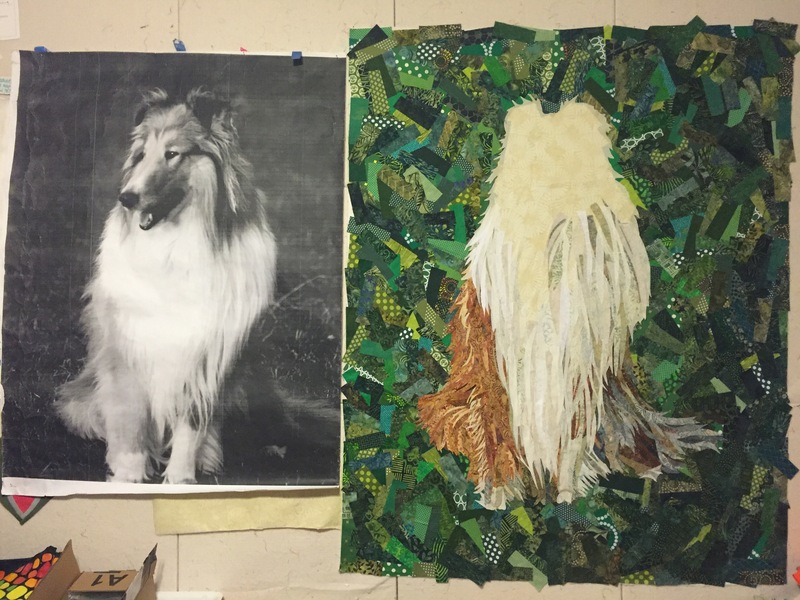 The tail and feet took several nights. This was the third night, when Ella decided that I had made a soft nest for her, and she really didn’t care if I needed those shreds of fabric. Progress was steady. I’d post nightly on Facebook and Instagram and people kept cheering me on, which was awesome. His feet were really hard to get right. I finally gave up and decided to deal with them later, and started moving up his body instead. Trying to get the right shadows of light and dark on his collar was a huge lesson in value and hue for me — lots of color play involved. Batiks can be used on either side with very little difference and they don’t fray because of the tight weave and the wax resist, which made them perfect for this technique (especially with all of the repositioning, the fabrics really got manhandled). With the prints, sometimes I used the right side and sometimes I used the wrong side, depending on what worked best in a particular location. Layering thin white fabrics on top of darker fabrics gave me even more color options to consider, which was a thrill, too. I learned a LOT. 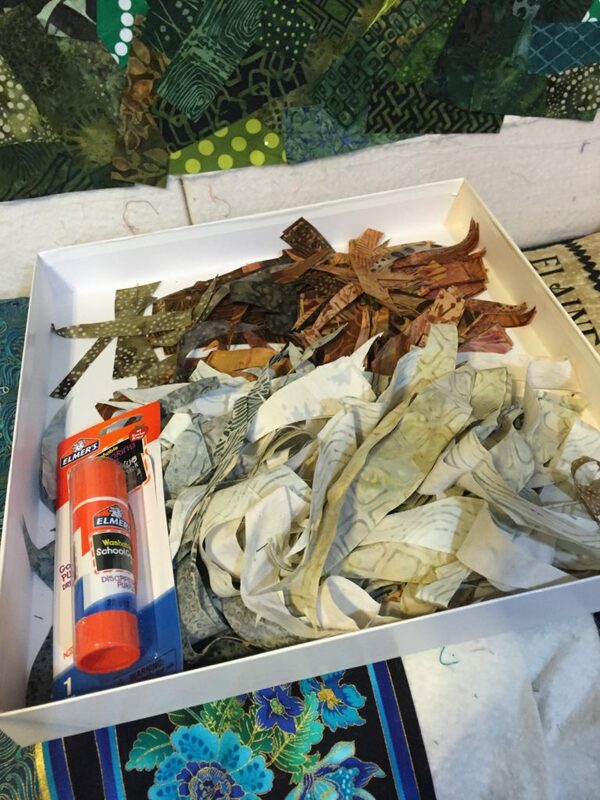 I kept running out of colors — browns, tans, whites, grays… and I kept having to go back to my stash and raid it for more, cutting the pieces into shards with my rotary cutter so that they’d be easier to use and require less scissor work. Even so, I developed a callus on the knuckle of my right index finger from the scissors. And then… Gulp… it was time to work on his face. 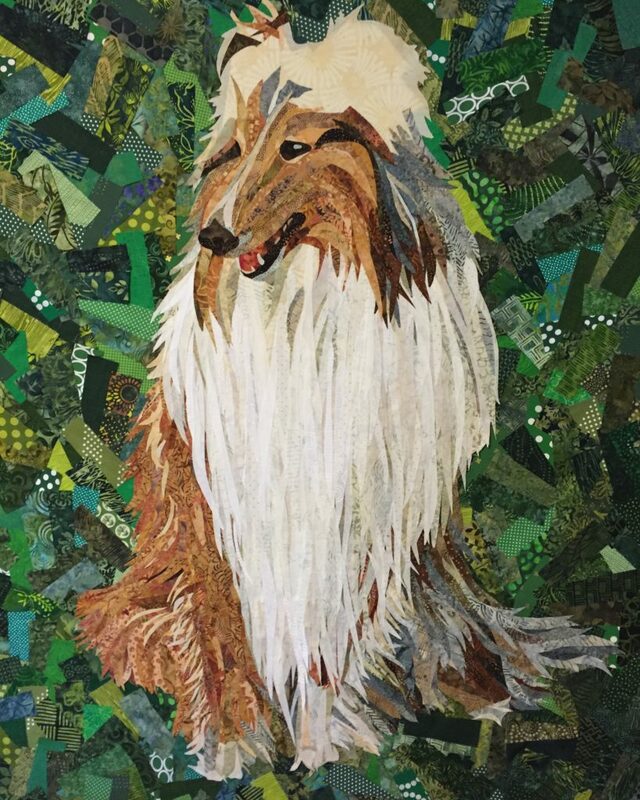 I had traced the locations of his eyes, the gray and white blaze on his forehead, and his nose. I placed all of those. Then I started filling in around them. Jerry came in and took this picture as I worked on his face, which I love. I think I had just fixed his eye to be the correct size (it’s too large in the above photo and correct in the one two down from here). 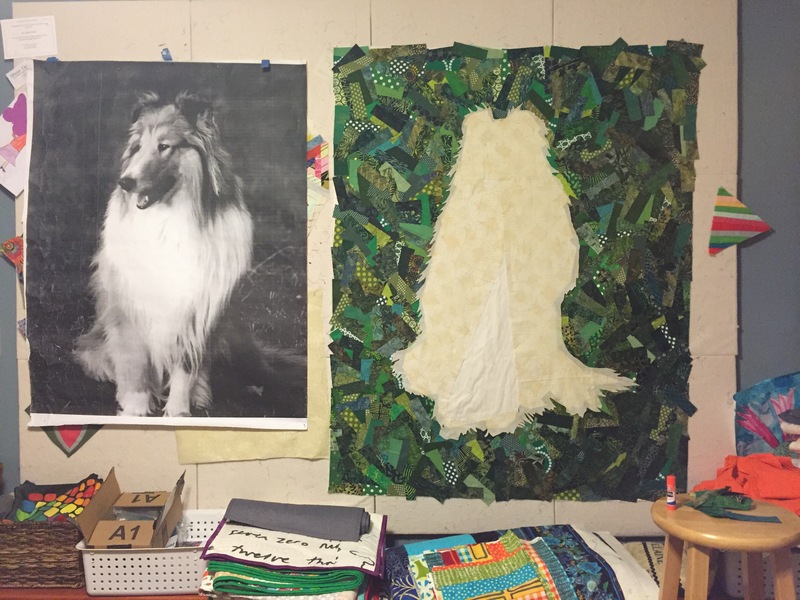 The process photo really shows how I was working and just how large the piece really is — I think I was on glue stick #4 by this point. 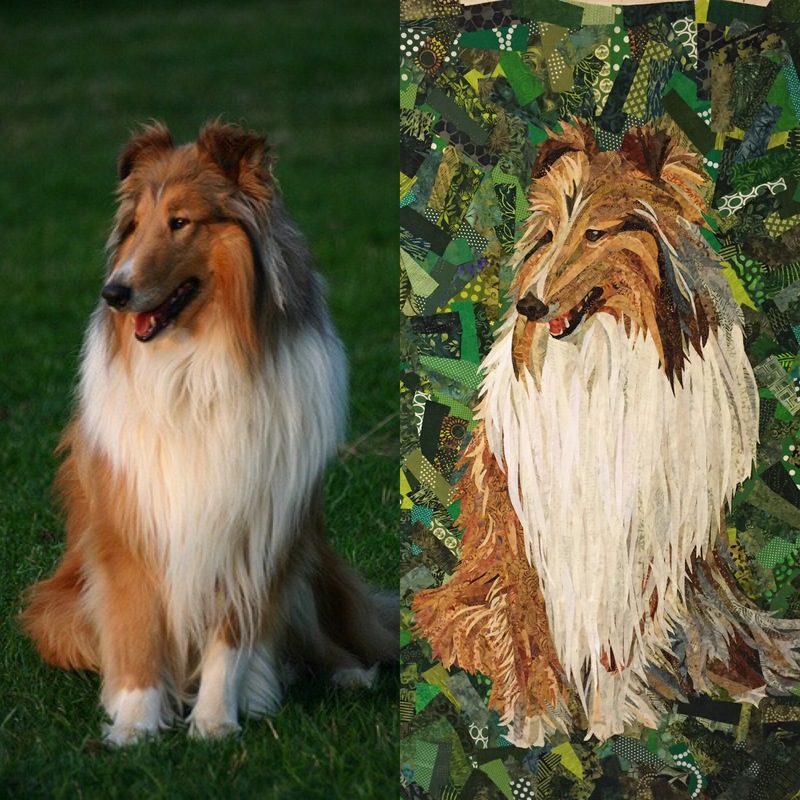 Once he looked like himself, I started putting the original photo next to a photo of the fabric collage in one of my phone apps so that I could compare them more easily. 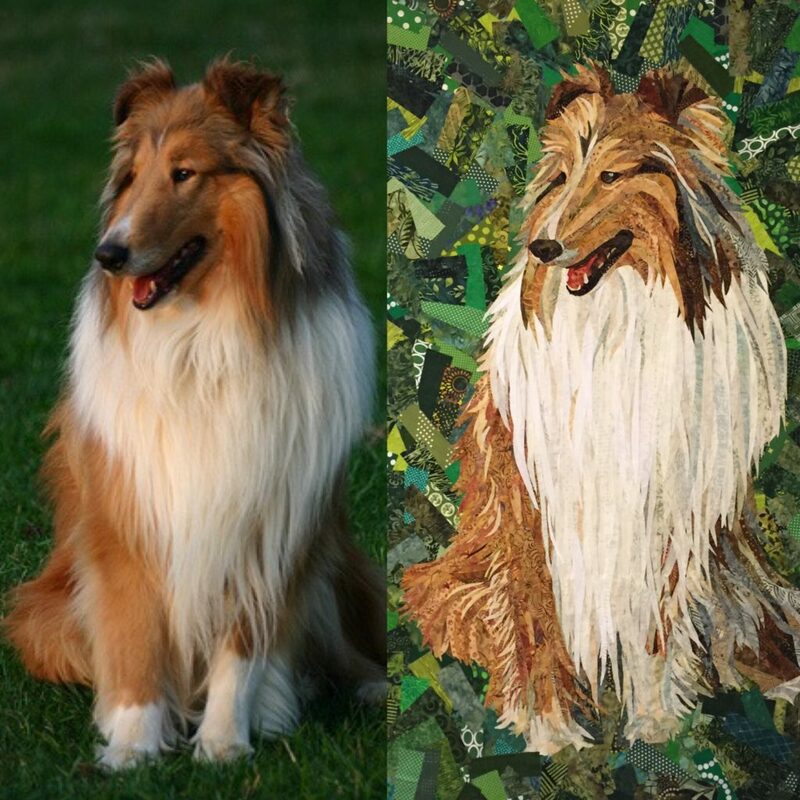 Close, but his legs are still weird and his face is Sheltie-like. I ripped Linus’s face off about 4 times and his feet even more than that. 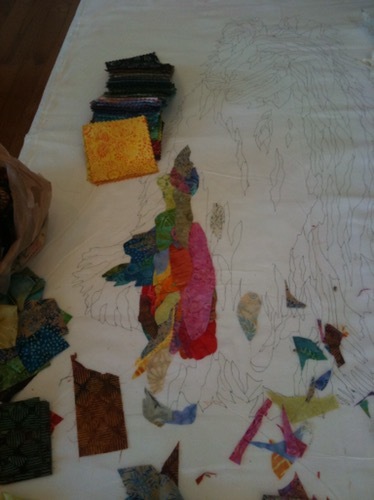 And the photo below is what our entire house looked like for the month I was working on this quilt. 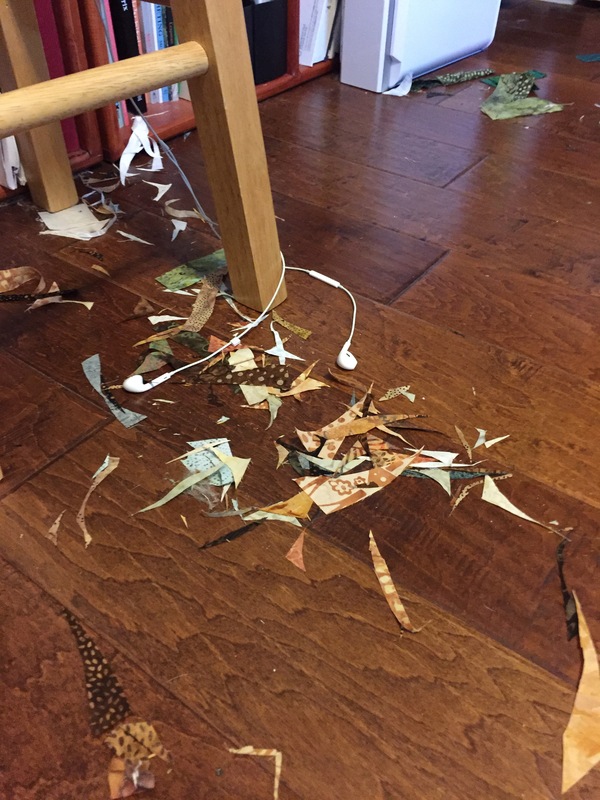 There were little shards of fabric EVERYwhere. They’d get tracked everywhere by me, the cats, the dog, the kids. We’re still finding them. 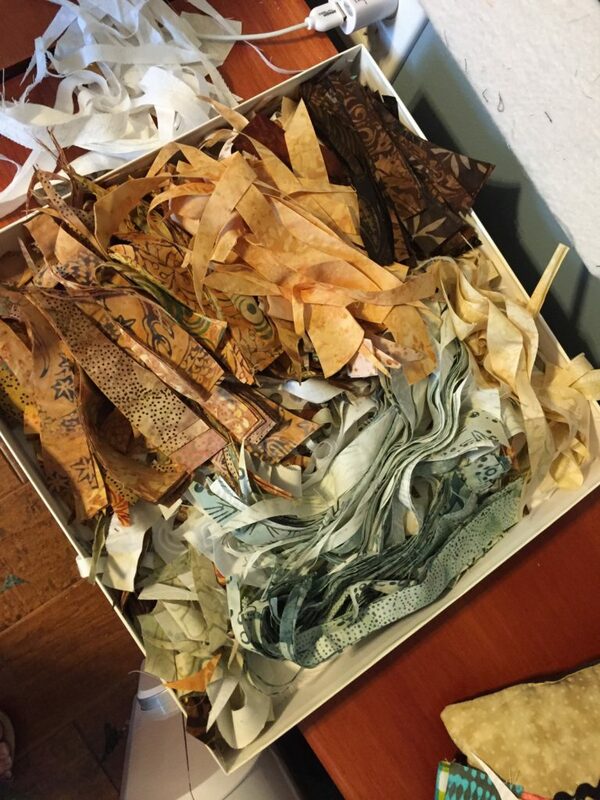 When I needed a small piece of fabric as I was working, I’d hunt for it on the floor first — these were usually pieces that already had some glue on them so I didn’t want to put them back in the box with the still-clean pieces. More work on the eye, getting the expression right and getting the shading around it better. 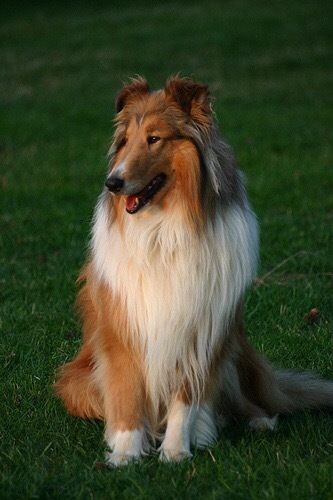 But still a Sheltie face. See? Compare Linus’s nose on the left with the little nose on the right. It’s… wrong. It’s not too short, really, but the proportions were wrong. 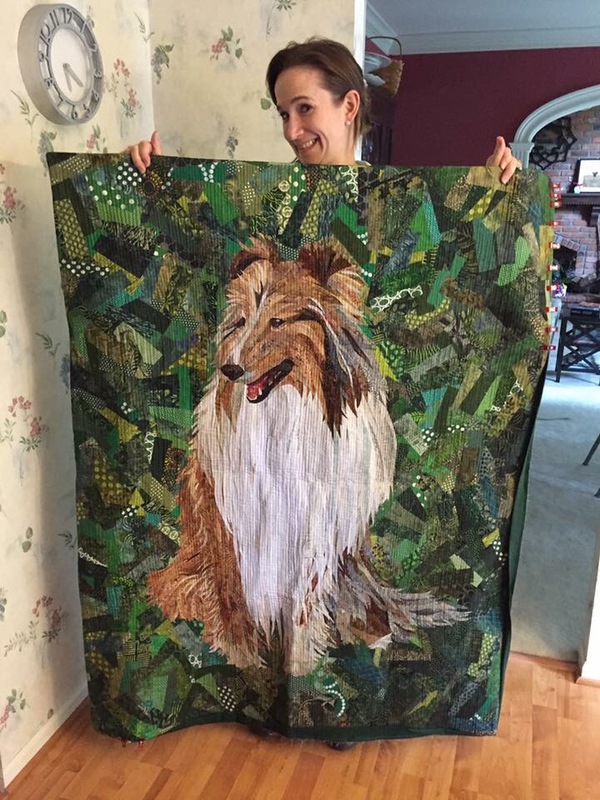 After working on this quilt and watching Linus go from being a Sheltie to being a Collie, I now know definitively what the structural difference is in a Collie’s nose vs. that of a Sheltie. It’s not the length of the nose, at least not in proportion to the head. It’s the height of the nose/jaws. When I lowered his mouth a full inch (!!) 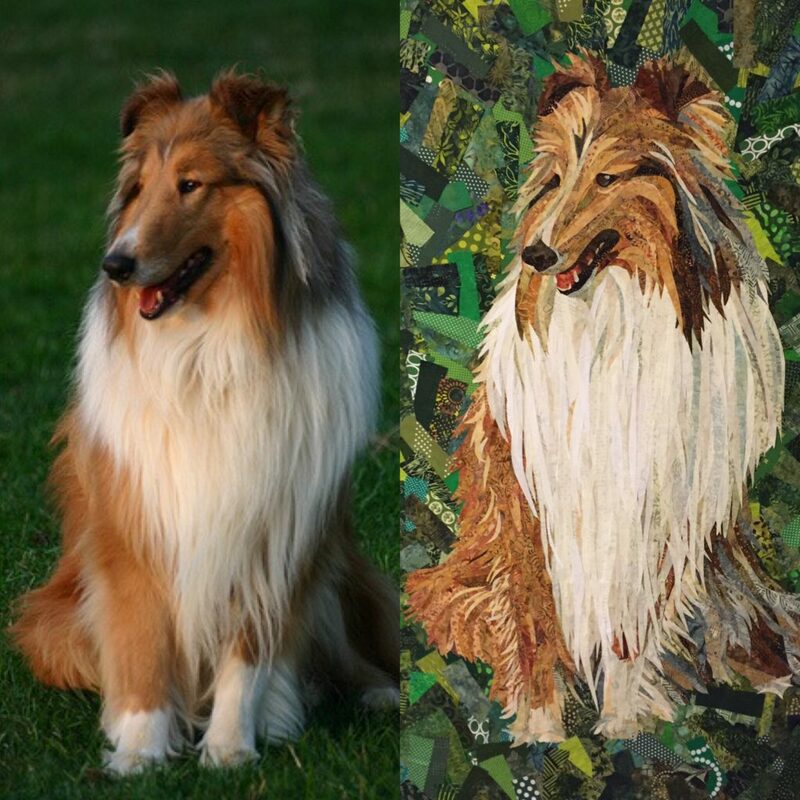 and filled in with more brown, he suddenly looked like a Collie. I lowered his bottom jaw so he’d be smiling like Linus was in the picture. Subtle difference that totally changed the breed identity. 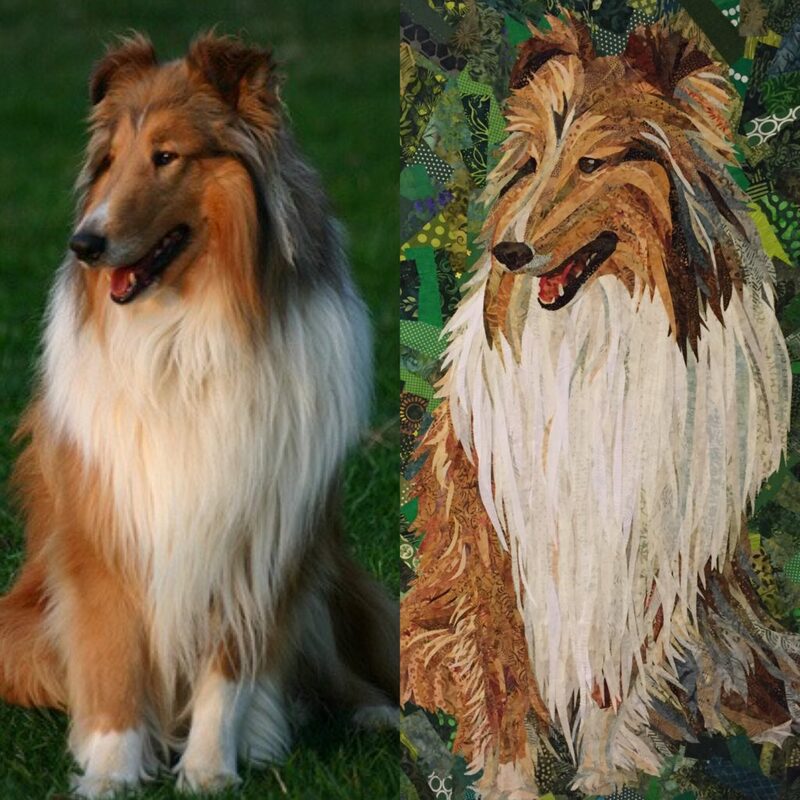 Those of you who don’t know Collies and Shelties well won’t really see the difference, but anyone who does? I’m sure you’re nodding right now. But his feet were still flummoxing me. I ripped them off and moved them back and forth several times, but they still looked wrong. So I finally resorted to technology. 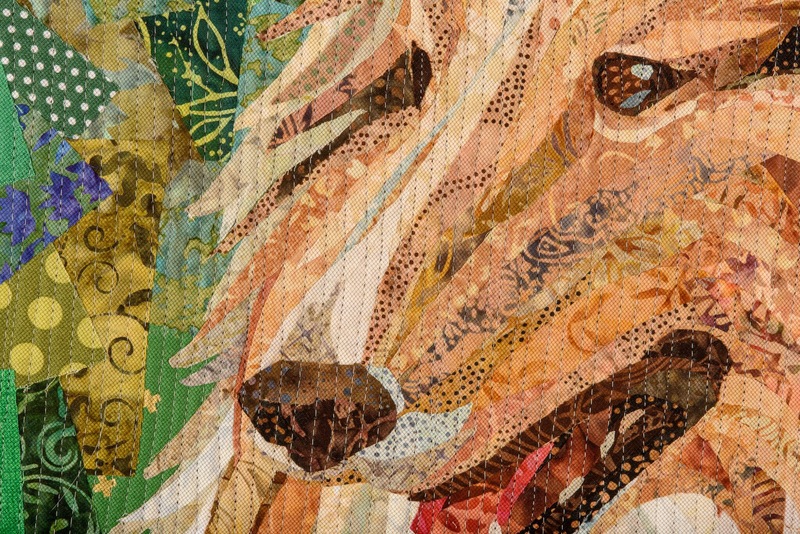 I took the original photograph and made it transparent, and overlaid it on top of a photo of the quilt. The face? PERFECT. The bottom lip is 1/4″ to the right of where it should be, but I decided I can live with that. Linus’s mouth isn’t getting ripped off again. And the overlay helped me see what was wrong with his feet. They were MUCH too narrow. The spacing was good, but because they were so narrow I couldn’t get the spread to look right — he had chicken feet. 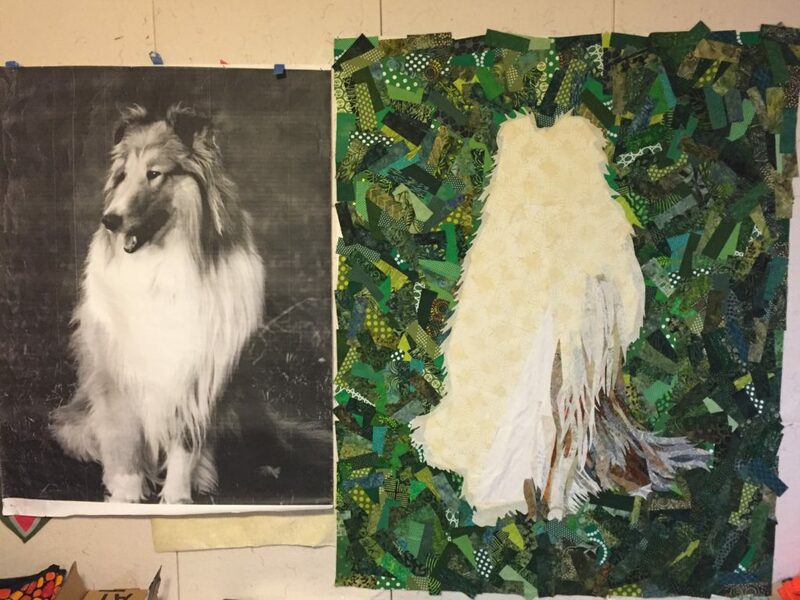 So I ripped off the bottom section of him again (poor dog) and moved everything around, adding and subtracting more fabrics. 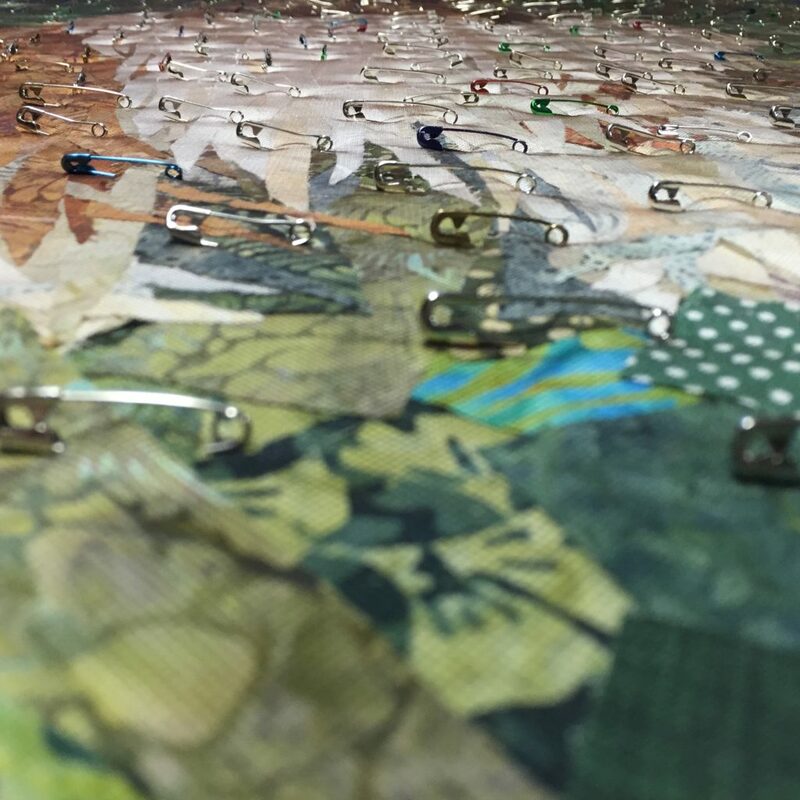 Rather than glue it again before I was SURE, I just stabbed pins into the design wall and decided to come back the next night to make a decision before gluing it all down. Yes! Got it! The legs looked good, FINALLY. 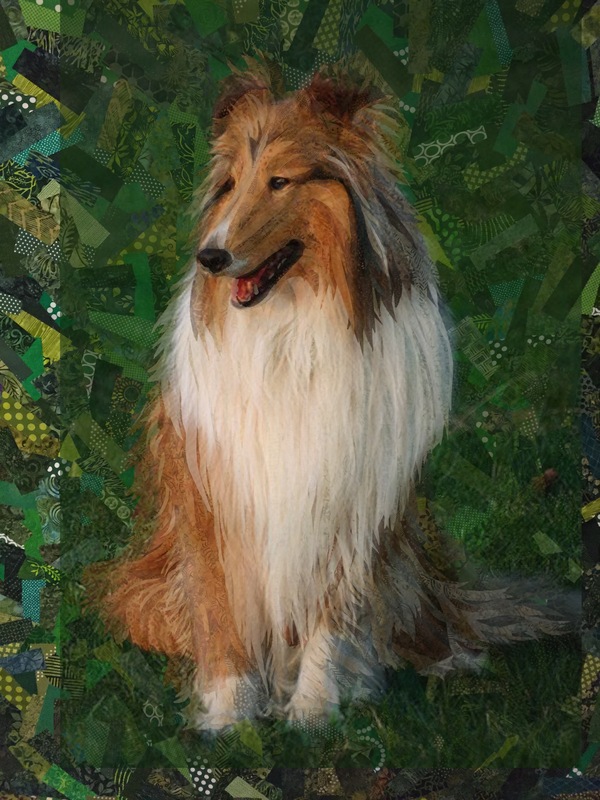 And I decided that because blades of grass obscure some of his feet in the original photo, I’d pull up some of the green background fabrics to do the same. That would resolve any lingering issues I had with the feet. At this point, a few people asked to see the whole process all in one picture so I posted this on Facebook and Instagram. And got about 100 new followers in a 24-hour period. For l’il ol’ me, that’s a lot. 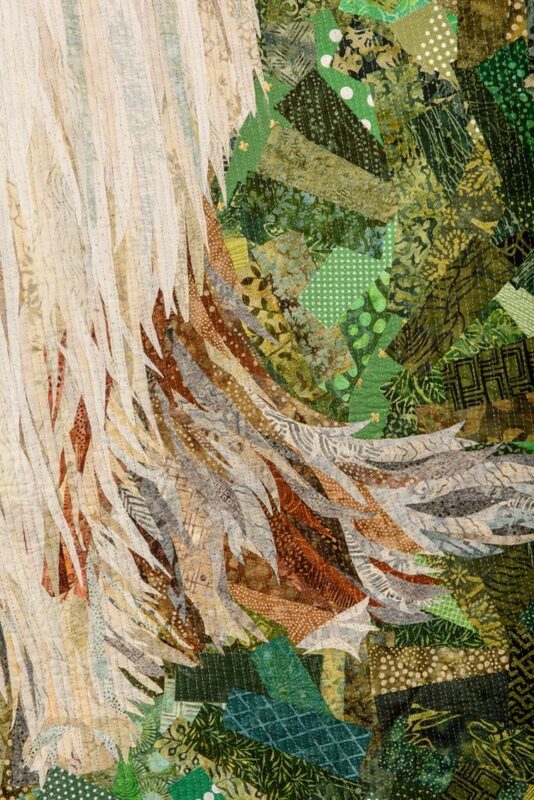 Every time I posted a progress shot of this quilt I’d get a burst of new people, which was definitely interesting to witness. I’ve been on social media for a while, but the biggest surge in activity for me has definitely been in the past six months. 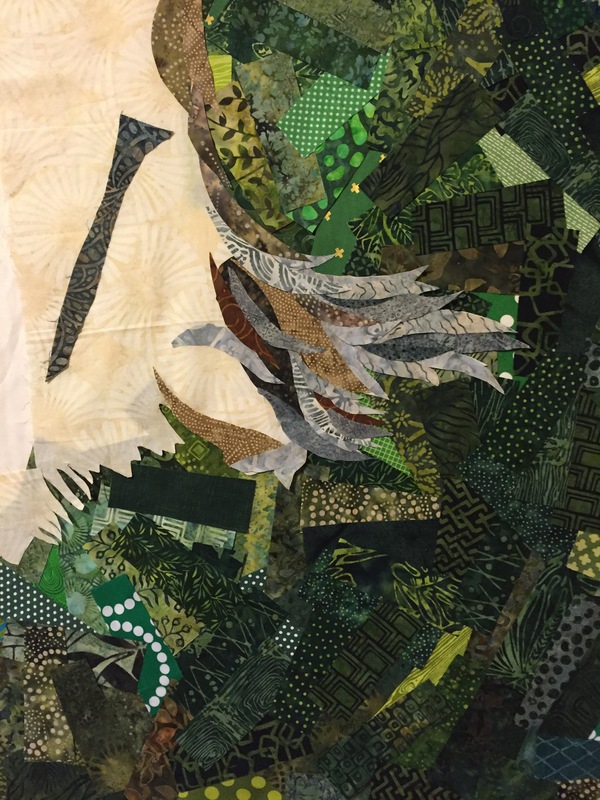 I used a fine-tip applicator and Elmer’s Washable School Glue to carefully glue down every single edge of every single piece of fabric in the collage. This took two nights of work. Because of the challenges quilting the faces and how I had to stop frequently to push little shards of fabric back under the needle, I decided to borrow an idea from Susan Carlson and layer some tulle (fine netting) over the top of everything. 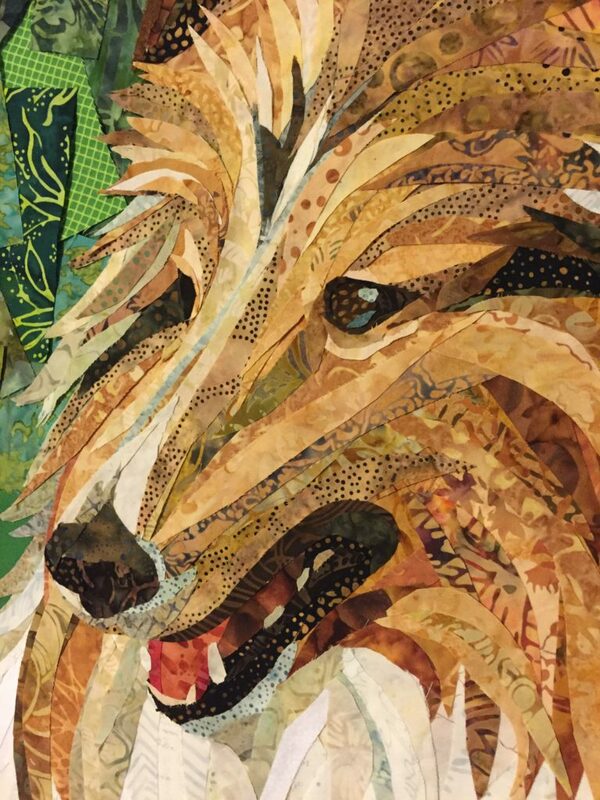 This gave me a flat surface to quilt and an added layer of security for the raw edges. I bought gold, taupe, dark brown, and black tulle since it was only $1.29/yard. Gold was fine on Linus but showed too much on the green. Taupe made everything flat. Black looked awesome on the green but dulled Linus. Dark brown was fantastic, though it did darken the white fabrics a bit. Mom offered up her table for pin-basting, since crawling around on the floor to pin-baste this one would likely have damaged him too much. 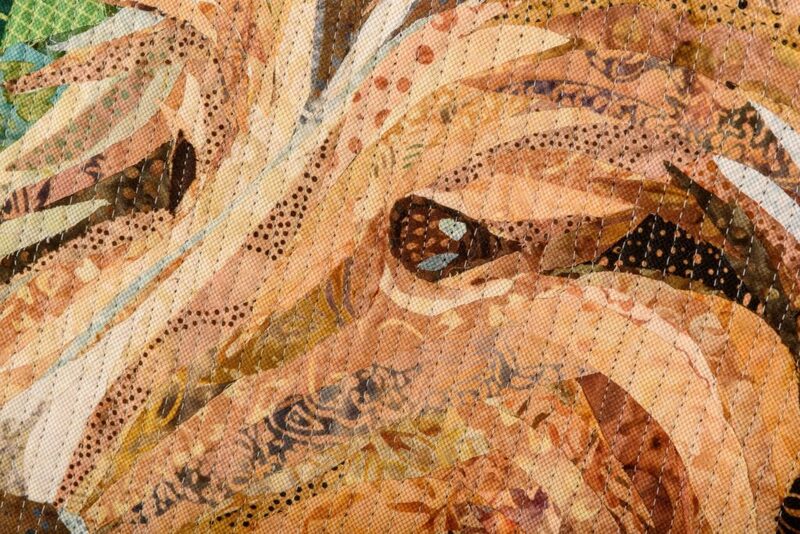 Yes, the dark brown tulle is covering the entire quilt in the photo below. Hard to see, no? 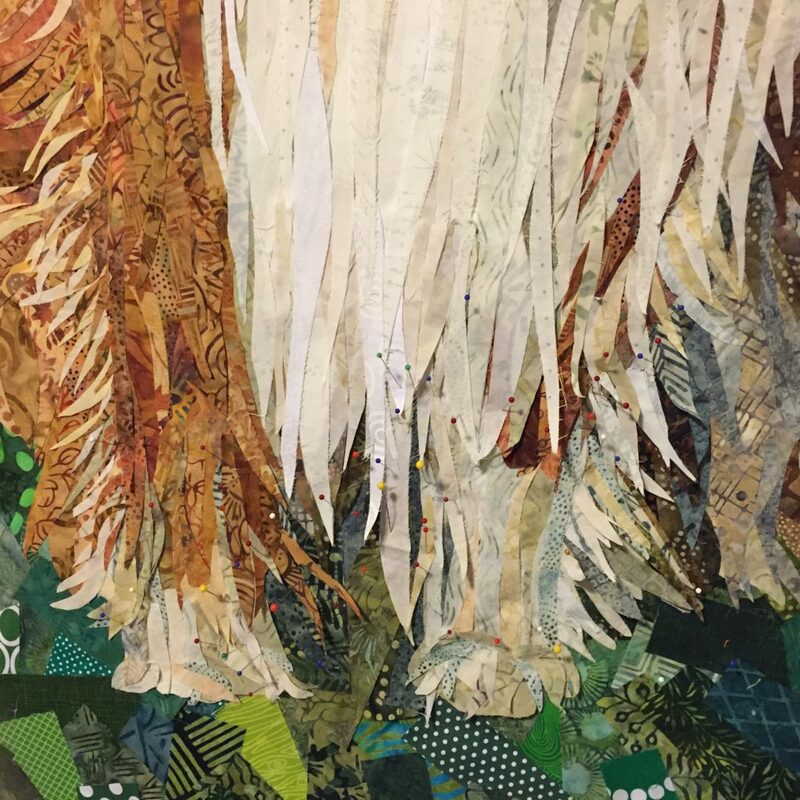 I pinned excessively — about every 1.5″ — since I knew that the process of quilting this one would make some of the glue pop loose as the quilt was moved back and forth under the needle. My paranoia proved to be correct, and I was very glad to have so many pins. You can see the tulle a bit better in this photo but it’s still hard to see unless you know it’s there. And then the quilting. 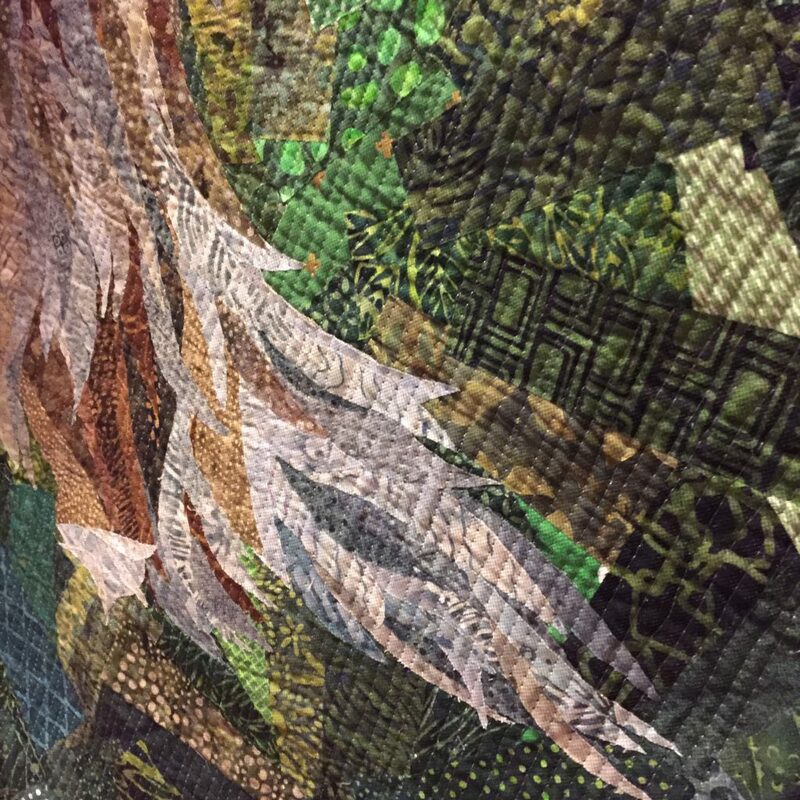 I used 100-weight Invisafil thread by Wonderfil Specialty Threads in Color #718 for the quilting. 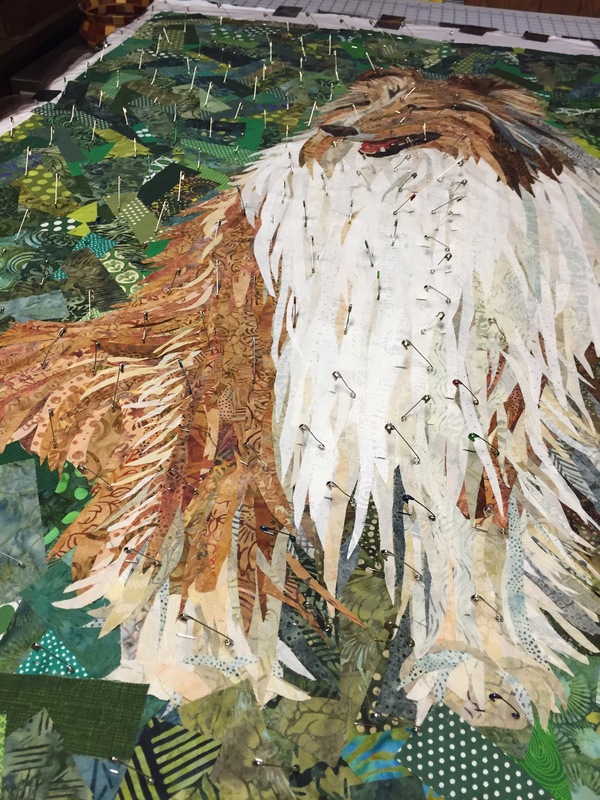 It was perfect — the coldness of the gray brightened the whites in the collar that the dark brown tulle had dulled, but the quilting almost disappeared. 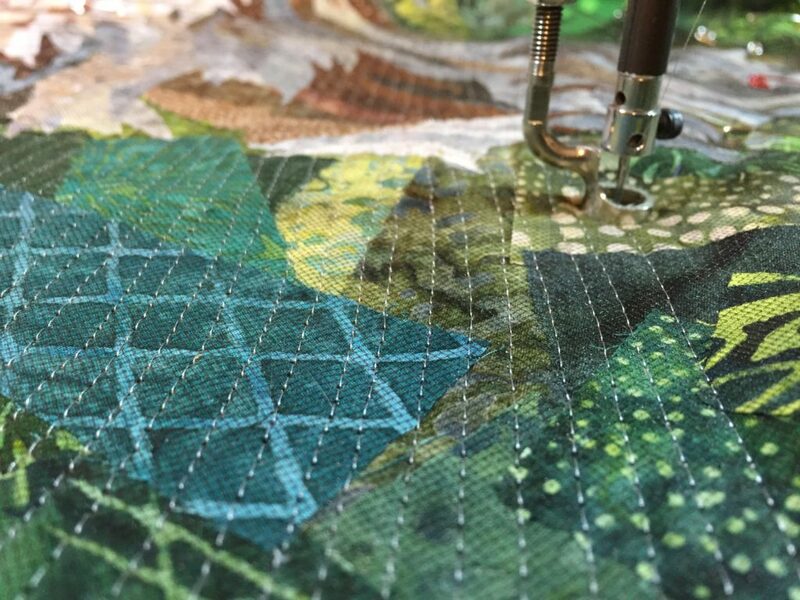 I did organic free-motion straight line quilting with my HandiQuilter16, with no stitch regulator. Back and forth, back and forth…. 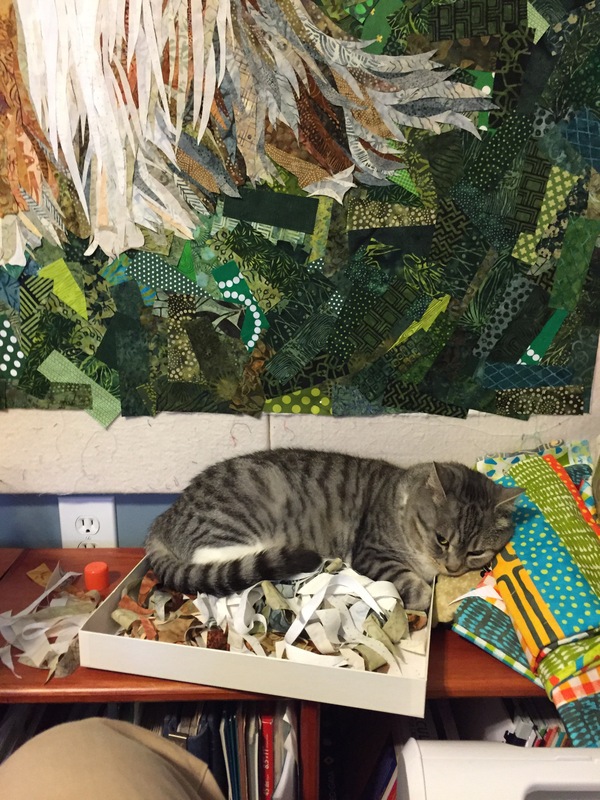 Because the glue was starting to pop on Linus’s hair, I knew that I couldn’t fold or roll the quilt while it was in the process of being quilted. But because it was the last week of the school year, I had to go to bed at a reasonable hour. So each night I draped it over my ironing table so that it would not have any folding stress between work sessions. 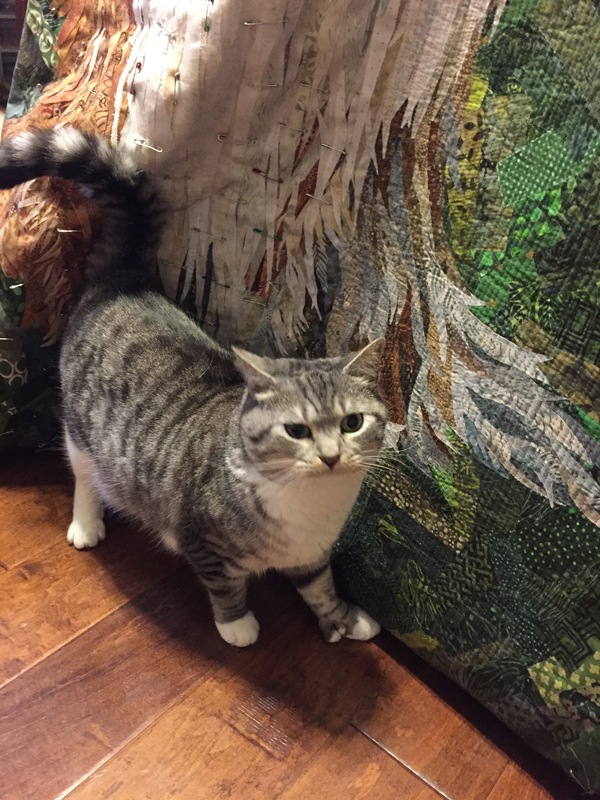 Ella was mad that she couldn’t cuddle-test the quilt, as is her custom when I stop for the night. 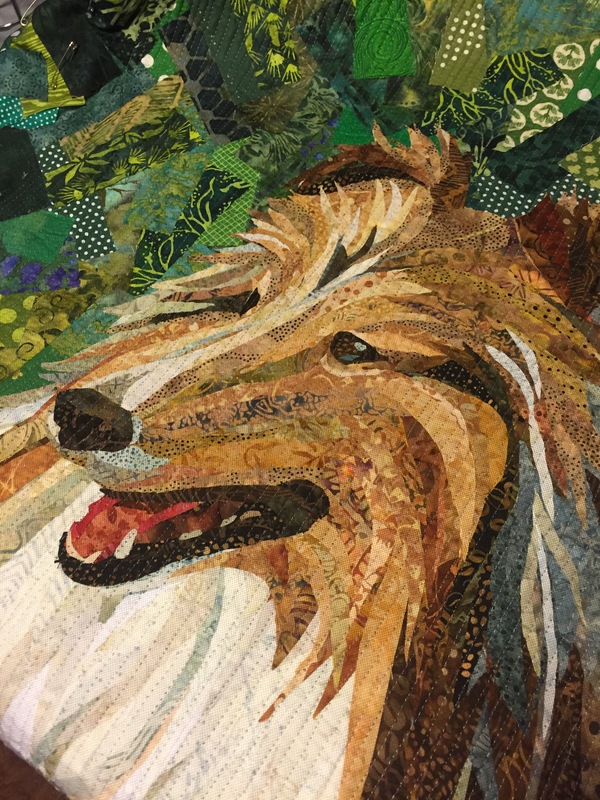 I just loved watching the texture come alive as the quilting got finished and every piece was secured in place. I did have to reach through the tulle a few times with a stylus or the tip of a seam ripper to flip tiny pieces of fabric over or shift things around, but most of the time things stayed where they were supposed to. 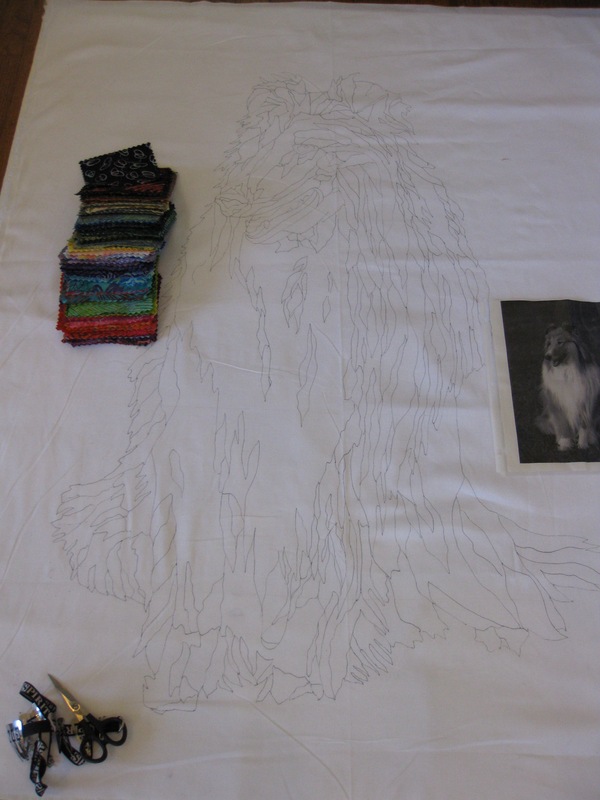 With only about 4″ of Linus’s haunches left to go (and about 16″x55″ of background remaining, I ran out of thread. At 3pm on Saturday of Memorial Day weekend. ARGH. So I spread the quilt out and Ella arrived INSTANTLY. Look at the sweet boy! So that I could still work on other things while I waited for more thread, I had to rig up a hanging station. I was quite pleased that my stash shelves were so perfect for this purpose. Linus hung out like that for the rest of the weekend. 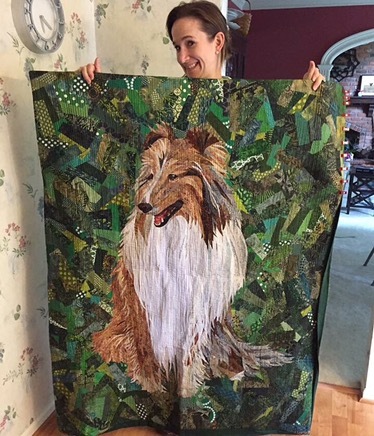 I finished quilting Linus and attaching the facing at 11:30pm on May 31, hours before I left on a trip to Michigan for the weekend. 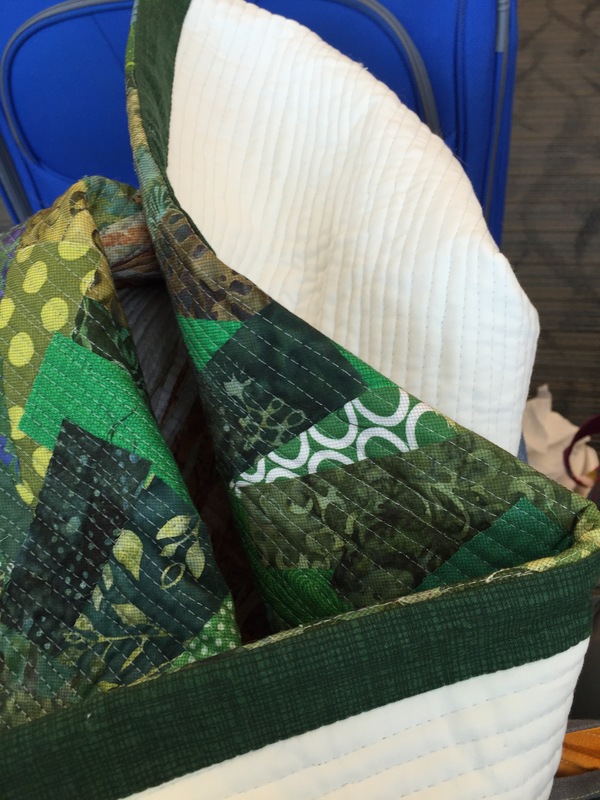 I took the quilt with me, since it could be folded now — and attached the facing in the airports and on my friends’ back deck. Here’s Linus with the facing partially attached, in Sue and Brian’s kitchen. After the weekend was over, I had professional photos done so that the colors would be better and lighting would be more consistent. The next 5 photos are by Jeff White. And Jerry took this last one: Friday wanted to say hello to his old friend. Linus will hang around in his favorite room in the house unless and until he travels. So. I don’t know what’s next. I haven’t been told yet.